Acworth Farmer’s Market! Farm Fresh Fun in Downtown Acworth… YUM! 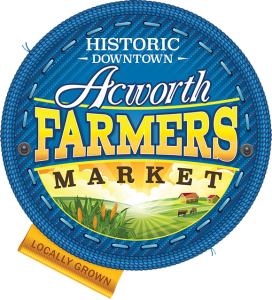 The Historic Downtown Acworth Farmer’s Market takes place on Friday mornings between April 5 and October 25 from 8:00 a.m. to noon. The market is located in the Logan Farm Park Expansion, located at 4405 Cherokee Street in Acworth. Market customers will have a wide variety of garden ripe Georgia grown vegetables, eggs, cheese, bedding plants, fresh baked bread, pies, cakes, honey and jams to choose from each week. This year’s market will be bigger and better than previous years and shoppers won’t believe the selection of home grown goodies! The Acworth Farmer’s Market is proudly sponsored by the Acworth Downtown Development Authority. If you have questions about the market please contact Jeff Chase at jchase@acworth.org. Click here to view the Acworth Farmers Market Facebook Page.